Duration: HD Video 16:9/ 1 channel x 8 minute Loop. Projected video and sound installation, applying Scanning Electron Microscopy (SEM) to trace the topological features and atomic structures of BLACK LACE to allude to narratives of art, science, biotechnology and nature. The Black Lace projects explore the fault lines between nature and culture. Black Lace involved a destructive micro-visual analysis of a sample of antique silk Chantilly lace. Hundreds of hugely magnified studies were produced using a Scanning Electron Microscope (SEM) in collaboration with scientific imaging specialists from the University of Southampton’s Biomedical Imaging Unit. These were digitally recomposed to create a continuous, slow panning shot of lace montages in virtual 3D screen space. The resulting scrolling lace landscape is set against a multilayered, stochastic sound composition of larval silk moths devouring the mulberry leaves that fuel the production of the silk protein fibers. 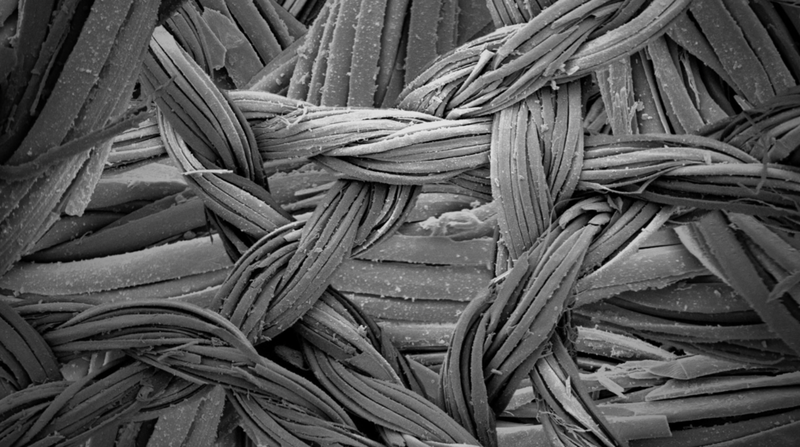 SEM was used to visually evidence the underlying mathematics and structural torsions of Chantilly lace in close conjunction with the theoretically unfathomable complexity of the silk fibers. The human Chantilly-net-maker mimics polygonal networks found in nature, but in the film, immensely magnified details reveal the lace’s intrinsic ‘otherness’ and silkworm origins. The non-optical electron materialization of the Chantilly net in the installation alludes to processes of biophysical metamorphosis and other lurking frontier narratives drawn from the contemporary biosciences and synthetic biology. The silkworm has biosocial significance and vast economies and whole communities depend on the molecular proteins of its cast-off capillary structure. Museum lace archive conservator support enabled an off-site destructive micro-visual analysis of silk lace from a unique sample of antique Chantilly lace. The donor sample is beautiful virtuoso piece of 20th century lace, bought from Steinman’s in Piccadilly London forming part of the Cadbury’s archive collection. Hundreds of hugely magnified studies were produced using a Scanning Electron Microscope (SEM) in collaboration with scientific imaging specialists from the Biomedical Imaging Unit, School of Medicine at the University of Southampton. Using complex, digital methods these were post produced and re-composed to create a continuous, slow panning shot of lace montages arranged along the Z axis in virtual 3D screen space. The resulting continuous scrolling lace landscape is set against a multilayered, stochastic sound composition of larval silk moths devouring the mulberry leaves that fuel the production of the silk protein fibers. The Black Lace project breaks customary patterns of approaches to the material culture of lace, re-framing it as a complex biomaterial with bio-economic and bioethical dimensions. Black Lace alludes to the lurking fault lines between nature and culture and the work follows on from my wider research themes that also make cultural and artistic connections to the practices and narratives of contemporary biosciences. The decisive factor in using SEM was to visually evidence the underlying mathematics and structural torsions and twisting of Chantilly lace in close conjunction with the theoretically unfathomable and unimaginable complexity of the silk fibers. The human Chantilly net maker mimics polygonal networks found in nature but in the film, immensely magnified details reveal the lace’s intrinsic “otherness” and silkworm origins. The atoms, molecules and ecosystems deployed by the silk worms appear to operate like forces swelling out into shattered spirals. Each layered image in each scrolling scene of the film was technically drawn line by line by the deflections of a scanning electron beam operating in a vacuum. Each scene is intrinsically an image of lifelessness and the film is like a fossil. Human vision involves the register of light in the retinal nervous system and brain. The non-optical electron materialization of the Chantilly net in the installation alludes to processes of biophysical metamorphosis and other lurking frontier narratives drawn from the contemporary biosciences and synthetic biology. In the biotech context, the chemical co-alliance of humans and the insect species is spectacular in its imagination but in many ways can be seen to follow on from the 5000-year scientific techniques of Sericulture industry in Asian countries. Sericulture refers to the production of silk from the larval cocoon of the silkworm Bombyx mori. The silkworm has biosocial significance and vast economies and whole communities depend on the molecular proteins of its cast off capillary structure. The industrial killing and utilization of the silkworm can make us lose sight of the intrinsic mystery around its morphological developmental stages from egg, larva (caterpillar), pupa (cocoon) to adult moth and the fact that these intricate developmental mechanisms of metamorphosis are little understood by modern life science. Black Lace alludes to the lurking fault lines between nature and culture and the work follows on from my wider research themes that also make cultural and artistic connections to the practices and narratives of contemporary biosciences. The research outcomes represent a unique artistic, experimental approach to scientific imaging methods using Scanning Electron Microscopy (SEM) and fluorescing CLSM (Con-focal Laser Scanning Microscopy) building on paradoxical optical and quantum principles of image processing to forge a synthesis of hidden forms, wavelengths, signals and the instrumentation of matter. The project has resulted in transferable knowledge by extending the experimental use of non-optical microscopy as a “plastic” technical media for the production of art. The project extends the presentation of scientific imaging to encourage public engagement with the physics of non-optical bioimaging concepts and synthetic biology. The research engages in novel imaging production that extends the use of scientific imaging in the production of high-resolution HD video quality moving image display. The work aims to provides an accessible public engagement platform for public debate and awareness of ethical and cultural issues arising from the biosciences. The theory of being, ontology, brings us to atoms. The theory of relations brings us to the parasite. BLACK LACE was originally commissioned for the international exhibition, Lost in Lace. International conference presentation for Crafts Council UK- Framing Dark Space.